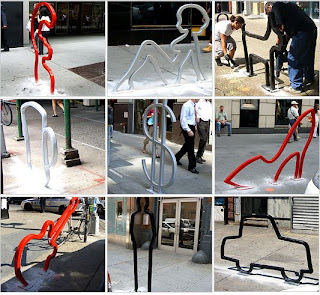 David Byrne, one of my favorite musicians and an avid cyclist, is a judge in the NYC bike rack competition. This former "Talking Heads" frontman created some of his own designs which were recently installed in 9 NYC locations. They'll be in position from July '08 to July '09 and then sold. I'll take the Guitar; I think it would be a good fit for Austin, TX.